The Professional Worker Series is a selection of targeted and focused ebooks which offer professional, sound advice on a number of key performance areas. The ebooks are written in an easy to understand style which cuts out all the waffle and padding, and instead gets right to the core of each subject. 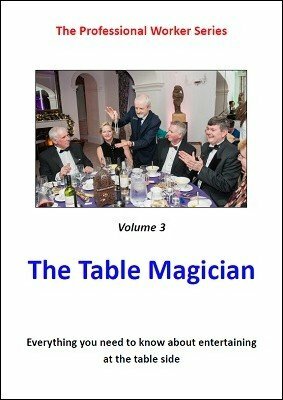 Volume 3 in this series takes a close look at what is required to work commercial magic at a table side. It's probably true to say that more opportunities are available for close up magicians to work at a table side than for any other form of close up. From big dinner functions with large numbers of tables through to hotels, restaurants and pubs, the commercial close up magician will regularly be asked to cope with performing under some often quite demanding situations. In this ebook I take a detailed look at all aspects of this type of work. I talk about the different size and lay outs of tables and what this means to you as a performer, I explain the difficulties you are likely to encounter from waiting staff, absent diners, and a myriad of other distractions, and I point out many of the pitfalls that this type of performance throws up and how you can avoid them. Even if you are new to this type of work, this ebook will cover everything that you need to get you started. The types of tricks to use, when and how to approach tables in the first place, plus a host of other important factors are all explained clearly and with practical considerations in mind. This is a book for workers that takes you logically through the facts and provides you with relevant information that will give you the confidence to take on this style of magic.